Children’s dental health is not always optimal. Effective brushing is not easy for many, especially for children. The challenges of mixed dentition and a short attention span means many are not spending the recommended 2–3 minutes when brushing. Smart Rinse has been formulated with children’s dentition in mind. As you would expect, it is alcohol and sugar free. The use of a mouth rinse can be fun, engaging and motivating to help establish good oral health routines for life. So consider recommending Smart Rinse for children over 6 who would benefit from improved oral health. 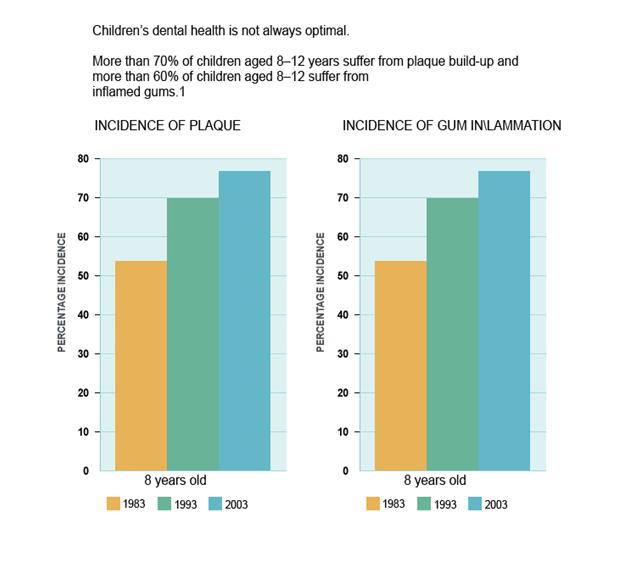 Children’s Dental Health in the UK, 2003, National Statistics. Data on file 103-0120, McNeil-PPC, Inc.
Driscoll WS et al. Caries-preventative effects of daily and weekly fluoride mouthrinsing in a fluoridated community: final results after 30 months. J Am Dent Assoc 1982; 105: 1010–1013.